As I got ready to put the kid’s little surprises in the traveling carrier on the forest funky advent calendar tonight, I whipped up a couple of quick & easy gift boxes made from recycled Christmas cards. I put 20 kr in each (about $3), and put them in the traveling carrier tin can for the kids to find in the morning. You’ll not believe how ridiculously easy these were. Thanks to Noreen at make-homemade-gifts.com I had the perfect tutorial to breeze right through this little project in minutes. Why did I still have old Christmas cards you ask? Because growing up my mom always saved her favorites and cut the pictures out as accessories on Christmas gifts the next year. Not because she was being environmentally trendy, but because as a single mom of 3 girls she had to be economically thrifty – that has always been a part of her lifestyle and I’m so glad to say that it has become a part of my lifestyle now, too. Thanks, Mom! I usually recycle my Christmas cards into tags but this is beyond cute! Thank you SO much for sharing. That's a cute box! Thanks for the mention. I've been saving my Christmas cards for years. I save the ones from work, too, LOL! 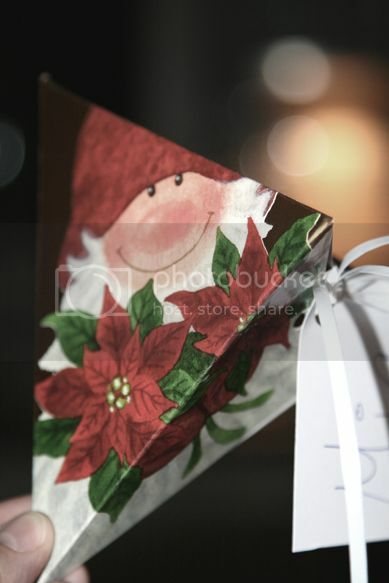 I use them for gift tags, cut the pictures out and string them on the tree, decorate gifts with them, all kinds of stuff. Christmas cards are the bestest! 🙂 LOVE these gift boxes, I'm definitely going to make a few of these to put neighbor gifts in, maybe put them in a nice Christmas-y bowl by the door or something!